President Donald Trump will meet Secretary of State Mike Pompeo for a full report on his crisis-response visits to Saudi Arabia and Turkey to craft the US response to the suspected murder of Saudi journalist Jamal Khashoggi. Anonymous Turkish officials have leaked increasingly gruesome details of Khashoggi’s alleged murder, implicating the Saudi state, to pro-government press and US publications. But while these officials claim to have audio recordings of the murder, they have not shared them with the United States and instead chose to leak them to the press. Trump explicitly does not want to harm the relationship with Saudi Arabia, which he credits with creating jobs. But as global pressure mounts, his hand may be forced. So far, Trump has come off sympathetic to the Saudi version of events, floating the idea that “rogue killers,” and not Saudi officials, had Khashoggi murdered after a phone call with Saudi King Salman. But a slow drip of leaks, one more gruesome than the next, from unnamed Turkish officials speaking to publications that blatantly pull for Turkish President Recep Tayyip Erdoğan allege a brutal murder by top Saudi officials caught on tape. These Turkish officials have shared their stories, including their claim that an audiotape of the murder exists, with top US and Turkish publications. However, they have not shared the alleged tape with US officials. Erdoğan has led a fierce crackdown on the Turkish press, leading Turkey to become possibly the world’s biggest jailer of journalists. Under Erdoğan, Turkey has detained journalists for social media posts that are critical of his administration or appear to mock him personally. A similar purge has taken place among Turkey’s military, intelligence, and judicial officials. But while details remain shaky, one immutable fact drives suspicion – Khashoggi hasn’t been seen since entering the Saudi consulate on October 2. The swarm of anonymous Turkish officials leaking details about the ongoing investigation has painted a picture of a wildly bold and brutal Saudi regime, and US sources have reportedly begun to corroborate their story. “American intelligence officials are increasingly convinced that Crown Prince Mohammed bin Salman of Saudi Arabia is culpable in the killing of the dissident” Khashoggi, The New York Times reported on Wednesday. The potentially sloppy work of Saudi officials’ blanket denials and lack of a counter-narrative have also fuelled suspicion. Saudi Arabia waited two weeks before allowing Turkish investigators to search its Istanbul consulate, the suspected scene of the crime. Before those investigators could enter, cameras caught cleaning crews moving boxes and boxes of cleaning supplies into the building. Later, when Turkey asked to search the Saudi consul’s Istanbul residence, where unnamed sources in Istanbul alleged Khashoggi’s body was dissolved in acid, an 11-member Saudi investigation team entered the residence first. Turkish police hoped to search the residence the day prior, but Saudi officials couldn’t join them and delayed them until they could enter first, Reuters reported. The seeming impropriety of the investigation proceedings wasn’t lost on United Nations human rights chief Michelle Bachelet, who called for the waiving of Saudi Arabia’s right to treat its consular properties as sovereign territory, which allows them control of who can search what and when. Though Pompeo posed for smiling pictures with Prince Mohammed – who anonymous Turkish officials have called the man responsible for Khashoggi’s alleged death – reports indicated a tense meeting. Pompeo told the prince that he had to “own” the situation and “that every fact is going to get out,” CNN reported, citing a source familiar with the meeting. Pompeo went on to say that the Saudis had to conclude the investigation quickly, because “if they don’t, the US will have to deal with this,” CNN’s source said. Kevin Dietsch-Pool/Getty ImagesTrump with Prince Mohammed in Washington in March. 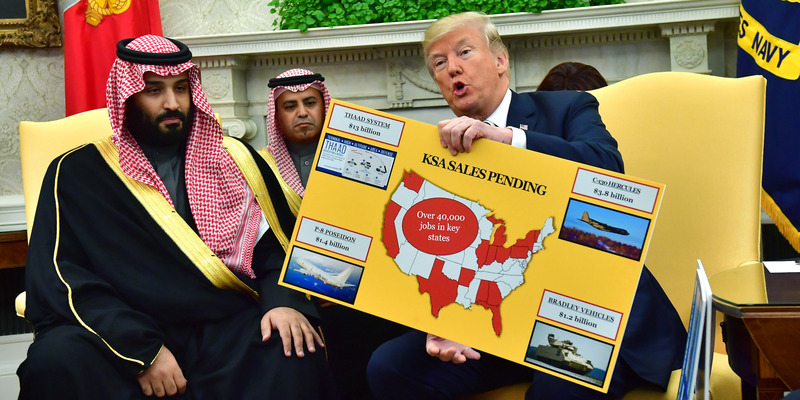 The US president does not want to reduce arms sales to Saudi Arabia as a response to Khashoggi’s disappearance. Trump explicitly does not want to damage his relationship with Saudi Arabia and often touts a $US110 billion arms deal as a boon to US jobs he doesn’t want to impact. But in many ways, the damage to the US-Saudi relationship has been done. Within Congress, a bipartisan raft of senators wants to sanction Saudi Arabia or restrict arms sales. Republican Sen. Lindsey Graham, usually a stalwart Trump ally, emphatically called to end arms sales. Businesses have also abandoned the prospect of investing in or continuing ventures with the Saudis in droves. At 10 a.m. on Thursday, Trump is set to sit down with Pompeo and formulate the US response to Khashoggi’s disappearance, which will undoubtedly weigh the mounting global pressure to punish Saudi Arabia against the longstanding alliance that has survived 9/11, a tragic war in Yemen, and decades of some of the world’s worst domestic human rights practices instituted and enforced by the all-powerful House of Saud.